Email alerts, scheduled configuration reports and change logs. 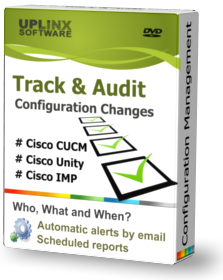 UPLINX Track & Audit has been designed for enterprises which require an automated, centralized and secure solution for configuration management of Cisco Unified Communications servers. Configuration and audit reports on this web-based solution can be accessed from any web browser after authentication. Running on Windows Server and Microsoft IIS, strong authentication with certificate-based encryption is readily available and can be configured within minutes. Domain-wide, standard-based Active Directory policies can be also applied to the Track & Audit server to enforce domain-wide security and control. User access can be authenticated locally with a configured password or authenticated with Microsoft Active Directory, and can be given to specific servers or report types and all access is logged for later auditing. UPLINX Track & Audit scales up to 50 Cisco Unified Communications servers (Cisco CUCM, CUC, IMP) and generates configuration and audit reports based on schedules. Cisco Audit logs are automatically gathered via FTPS from Cisco servers. Multi-cluster support up to 50 Cisco Unified Communications servers (Cisco CUCM, CUC, IMP). Multi-user support with user access control. Web-based solution running on Windows Server with strong security based on certificates and encryption. Centralized management of all reporting and audit logging with report repository for configuration management. Strong logging and auditing of access and individual actions. Cisco Server access is not required from each desktop running UPLINX Report Tool to view or generate reports. This enables you to firewall off all Cisco servers and allow dedicated access for the Track & Audit server. Users will only access the Track & Audit server and do not need the passwords of any Cisco servers. Authentication of login credentials via Active Directory means no dedicated administrative passwords need to be maintained.